Less is more. Or it would be where Major League Baseball is concerned. The rash of postponements due to snow and cold in the Midwest and on the East Coast – 24 and counting, and the season is just 19 days old! – ought to accelerate consideration for shortening the season. Baseball isn’t meant to be played in balaclavas and parkas, and the only time fans should need a blanket at the ballpark is when there’s a movie night under the stars. By doing away with interleague play, baseball could go to a 142-game season – and the schedule wouldn’t look all that different. The season could start April 15 and end Sept. 15, with the World Series ending by Oct. 15. There would even be room for additional off days. I realize reducing the schedule by 20 games is something akin to heresy. The major-league season has been 162 games for 50-plus years now, the one constant as baseball has added the designated hitter, seen the Montreal Expos come and go and endured a strike that nearly brought the game to its knees. It also will cost owners and players money, be it TV and ad revenues or ticket sales. But the season is too long, and the game is being hurt as a result. What with the expansion of the playoffs, the addition of interleague play and Major League Baseball’s attempts to temper the six-month grind with more days off, the season has gradually gone beyond its historic boundaries. Last year’s World Series ended Oct. 31. This season began March 29. Compare that with, say, the 1987 season, which began April 6 and ended Oct. 25. When 18 of the 30 teams play in cold-weather cities, and only two of those teams have domes, that’s going to be trouble. And it is. The 24 postponements so far are the second-most Major League Baseball has had in April since 2000, and there’s still almost half the month to go. The Minnesota Twins have already canceled four games, including three in a row over the weekend against the Chicago White Sox. 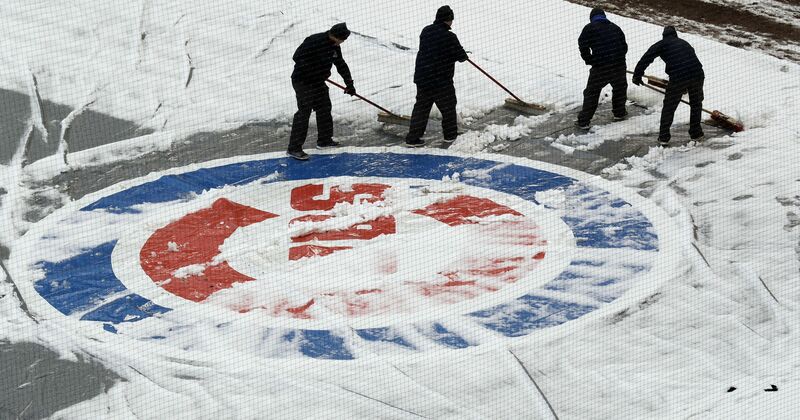 Both Chicago teams were snowed out at home April 9, and the Cubs had to postpone Monday night’s game against the St. Louis Cardinals after more snow and wind chills expected to be in the 20s. It’s not much better at the end of the season. Two years ago, Game 2 of the World Series had to be moved up because of the threat of rain in Cleveland, and Game 7 was delayed by more showers. Reducing the schedule might help baseball’s sagging attendance, too. While baseball’s TV ratings and digital reach are solid, ballpark attendance has steadily decreased since the record of 79,503,175 was set in 2007. Last year’s paid attendance was 72,670,423 fans, the first time since 2010 that baseball drew less than 73 million, according to Forbes.com. But is it any wonder, when most fans’ ballpark experience the first month is that of a popsicle? How many simply pass on those games, knowing there will be far nicer days to spend at the ballpark over the next five months? That first month isn’t exactly conducive to attracting young fans, either. What better souvenir could a kid want than frostbite or a cold? Baseball purists might howl at the thought of abandoning a schedule that’s been in place since their parents and grandparents learned how to keep score. But the game changes. It survived the addition of interleague play and it could survive its subtraction. By playing less games, Major League Baseball and its fans would get far more out of the season. Most of the time my favorite teams are out of it by August anyway, just in time for football. Brilliant idea. Apparently Ms Armour fails to realize that with 15 teams in each league interleague play is here to stay unless you want one team in each league to be off each day.